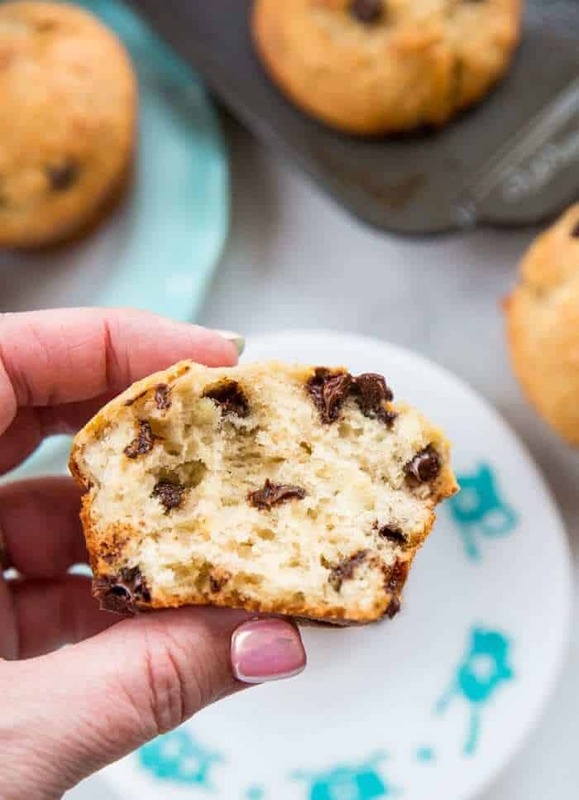 Chocolate Chip Banana Muffins are a fabulous way to use up those bananas on your kitchen counter or in your freezer! Kids and adults alike love these muffins and this recipe is so easy that you can make it weekly! This recipe uses oil, sour cream and chocolate chips to make incredibly moist and decadent muffins. The kids will go crazy over these in their school lunches! This recipe was updated April 12th 2018, it is from 2009! Take a peek at the inside of these muffins below: they are heaven! Look at that perfect crumb! These are soft, fluffy and moist muffins, exactly what you’re looking for! Mix the bananas, sugars, oil, egg, sour cream and vanilla extract together. Whisk together your dry ingredients. thoroughly, then add in the chocolate chips. Don’t over mix the batter too much! beautifully browned, about 10 minutes for mini’s and 20 for large. Necessity is the mother of invention, so they say, and this mother had to make a muffin that her kids would eat! I have tried oatmeal banana ones, but they never seem to like them, banana loaf is always a hit, so I thought it was time to whip up some chocolate chip banana muffins. Of course, you can always leave out the chocolate chips and you will still have a fantastic muffin! Do I make banana muffins with oil or butter? Oil is not the devil that it’s portrayed to be and if you use a cold pressed canola oil that has little or no taste to it, you are winning. There is a big difference in the texture of banana muffins made with oil versus ones with butter All muffins made with oil are going to be more cake-like, while the ones using butter will be denser. There is really no right or wrong choice, just your preference. 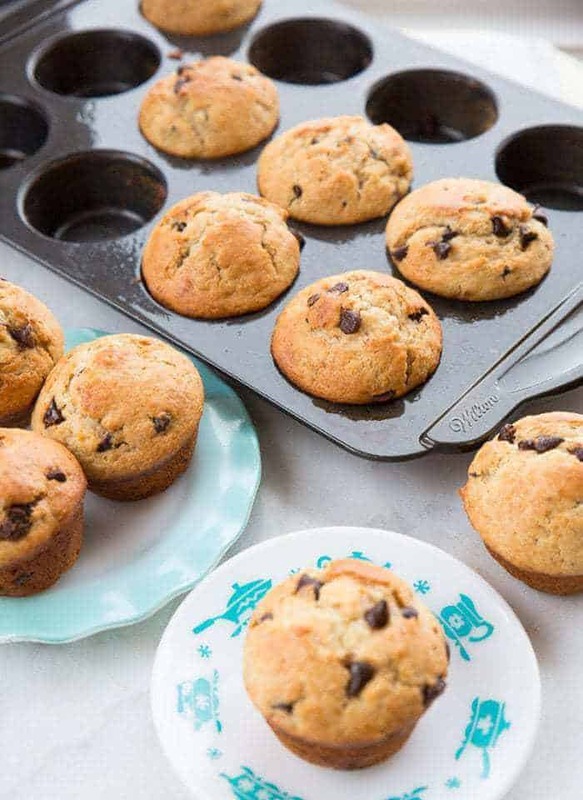 Can I make these banana muffins with applesauce? Yes! You can absolutely leave out the oil and make these with applesauce. 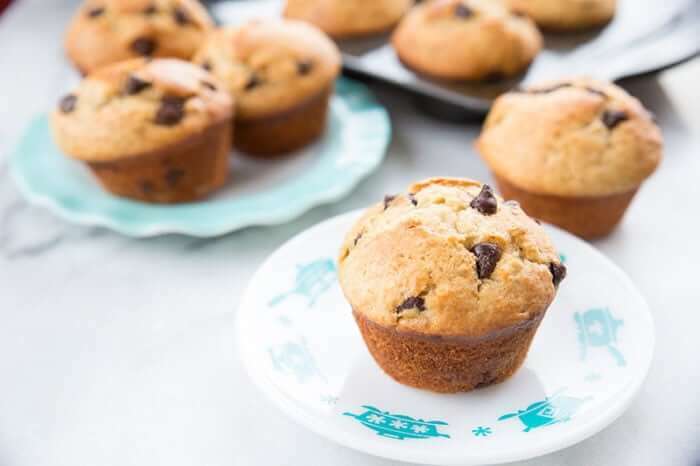 Again, please note that the texture of the muffins will be different than if you used oil or butter, but the muffins will be less in calories if you use applesauce and not oil. The choice is up to you. Does the sour cream make these more moist banana muffins? Yes, the sour cream helps make these muffins moister. That’s the aim when you are making banana muffins, you want them moist and decadent. This recipe for banana muffins uses sour cream and this helps yield deliciously moist and chocolatey banana muffins! The key is also to use not only the bananas but very ripe bananas as the riper the bananas are the more they mix into the batter. Do I have to use chocolate chips? No! These make a fabulous banana muffin that doesn’t need the chocolate chips. Er, I mean, well, everything NEEDS chocolate chips but you know what I mean, right? 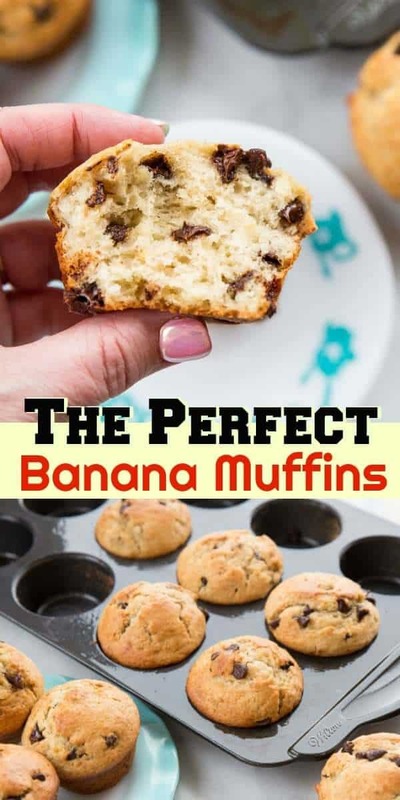 These are great for people that prefer plain banana muffins with no chocolate chips in them. This recipe works great in mini muffin tins as well! This recipe makes 12 normal muffins and two dozen mini ones. And they all disappeared really, really fast! Make sure that your bananas are SUPER RIPE. Not only do you get the sweetness from them you also get a boosted banana flavour! Don’t overbake these, as you want a nice moist banana muffin. I prefer dark metal muffin tins to light coloured ones, but adjust your time accordingly if needed. Not only is the baking time less, I just have better luck with them baking up recipes evenly. Pin this recipe to your SCHOOL LUNCH IDEAS or MUFFINS BOARD and remember to FOLLOW ME ON PINTEREST! 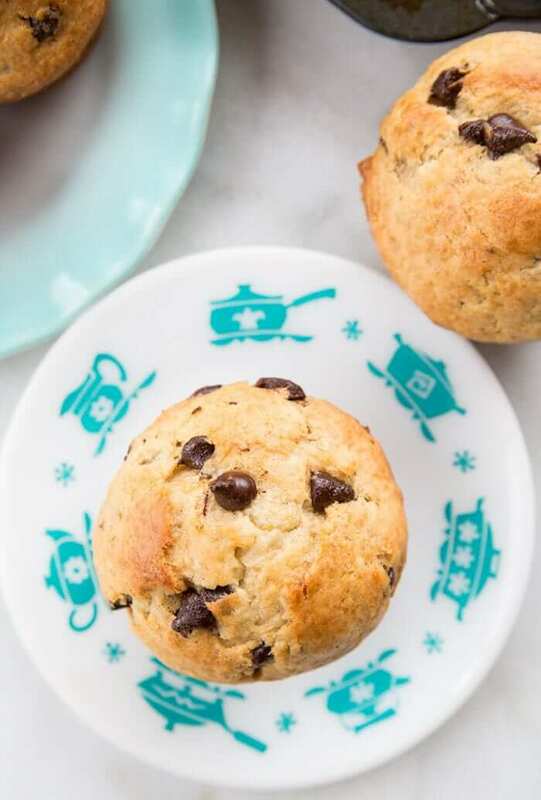 Chocolate Chip Banana Muffins are a fabulous way to use up those bananas on your kitchen counter or in your freezer! Kids and adults alike love these muffins! Combine the wet and dry ingredients until they are almost mixed together thoroughly, then add in the chocolate chips. Don't over mix the batter too much! Place into your lined or greased unlined muffin tins and bake at 375 degrees until beautifully browned, about 10 minutes for mini's and 20 for large. You can also drop the chocolate chips for normal banana muffins. I made these today and they were the best banana muffins I’ve ever made! Delicious! The only change I made was i added half milk chocolate chips and half cinnamon chips. They were great! What is the substitute for butter for the oil and substitute applesauce for oil? All of my recipes are packed away so I did a google search to find a recipe for my over ripe bananas and found yours! I’ve had good luck with all of your recipes I’ve tried and today was no exception! I doubled the recipe for our family of 10 and used white sugar because I was in a hurry and didn’t want to dig for brown sugar plus used regular chocolate chips. It made 2 dozen large muffins and they are delicious! I’ll be using this recipe from now on! Thank you! These are fabulous muffins and SO easy! Omg hahah 3/4!! Thanks for noticing that! Thanks! Going to make these today. Thank goodness! I was just trying to find a way to use up my VERY ripe bananas! Great recipe! ! No mini chips so can I use regular? They sound good! I just made these and they are beautiful and the texture is great. Thanks.